This is part two of my London travel tips for Antoaneta (or for you if you're headed that direction). In this installment, I will be discussing parks and department stores. London's parks are many and varied. I'm a fan of Green Park (south of Picadilly) and Kensington Gardens (in the Kensignton/Notting Hill area). 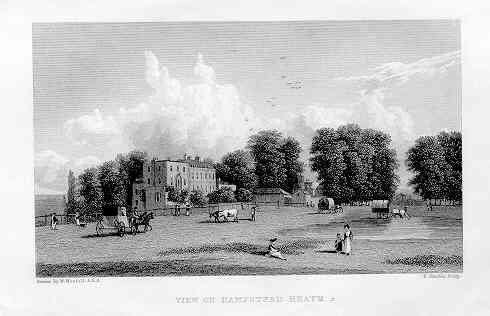 Another great London space is Hampstead Heath, which is north of the city centre. Here you can wander about like some tortured and forlorn Thomas Hardy character and you can also get an impressive view of the city. The most famous green space, Hyde Park, is a little like NYC's Central Park. There are a few interesting things along the perimeter and it has been the scene of some special events. But the interior is not too interesting and it takes a big commitment to walk the whole thing. Ahh, yes. London's department stores are the great bastions of colonialism. Or something. Selfridges on Oxford Street (by Marble Arch) has rebranded itself as London's hippest shopping destination. The exterior and furnishings are still those of a traditional old world department store. PS: There's even a mini Muji in there! But the big Muji is here. Liberty, on Regent Street just south of Oxford Circus, is very classy indeed. It's small but everything in there is a work of art. The building itself is a real landmark. Oooh, I just love F&M! They've been at 181 Picadilly for 298 years. But I only really care about the main floor: food and flowers. Their special blends of tea are the ideal souvenir for anyone (and for yourself!). They have many other posh treats, too. After all, the store has been appointed numerous Royal Warrants (such as, grocers and confectioners to HRH the Prince of Wales). F&M is definitely worth a visit. I was impressed by Harrods of Knightsbridge when I was, like, 13 years old but now I'm over it. The store is excessively gaudy, with faux gold sculptures at every turn. That being said, you really must visit the food hall which is spectacular. If you're going to be out for the day, I recommend picking up one of their posh sandwiches or something else portable. You can't leave the place without a growling tummy. I'd also recommend (although a bit more out-of-the-way) Alexandra Palace Park... the park itself isn't as great as Hyde Park or the Heath, but the view of London is completely unbeatable!